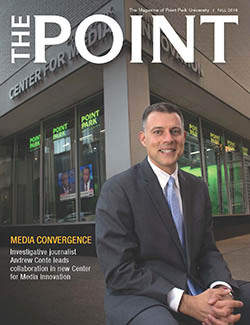 Media Convergence: Journalist Andrew Conte leads collaboration in the new Center for Media Innovation, kicked off at a campus celebration Sept. 13. Playhouse Rising: Construction on the new Pittsburgh Playhouse is well underway between Forbes and Fourth avenues in Downtown Pittsburgh. Walking on Air: Alumnus Fred McLeod's broadcasting journey has taken him from Point Park to the Cleveland Cavaliers' recent NBA championship. Building a Bridge: A gift from The Pittsburgh Foundation funds a pilot program to help at-risk high school students' transition to college. Paving the Way: Professor Stanley Denton leads the Black Men Teaching Initiative and College Now at Point Park. ESPN Employee Honor: Cinema arts alumna and former cross country athlete Brie Gallagher earns the Team ESPN VoluntEAR of the Year Award.